On this overcast Sunday (when it’s winter in Lima, everyday is overcast), the O’Ryans invited us down to Miraflores, the beachy, touristy area of the City of Kings, to have lunch with a slew of other folk from the United States who were making their home in Peru. 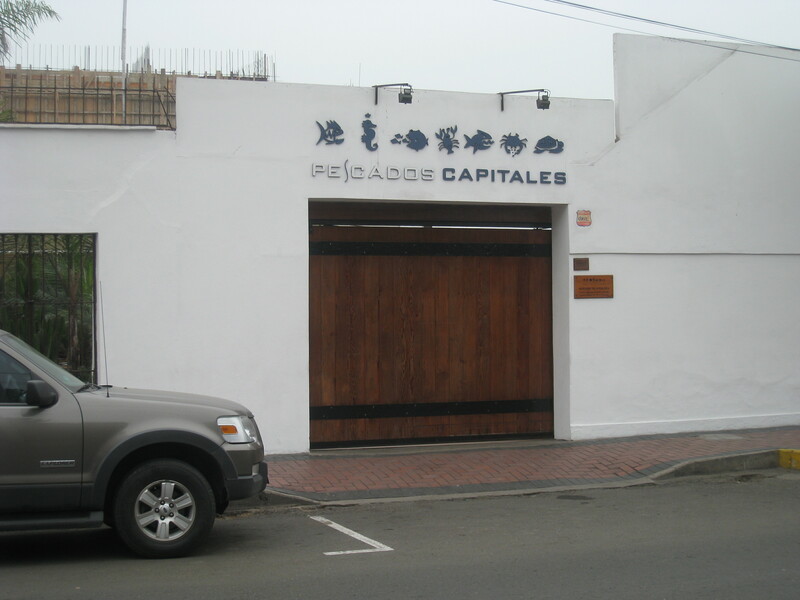 Our eating establishment of choice was Pescados Capitales. Before we ordered our food, the restaurant provided a wonderful appetizer. 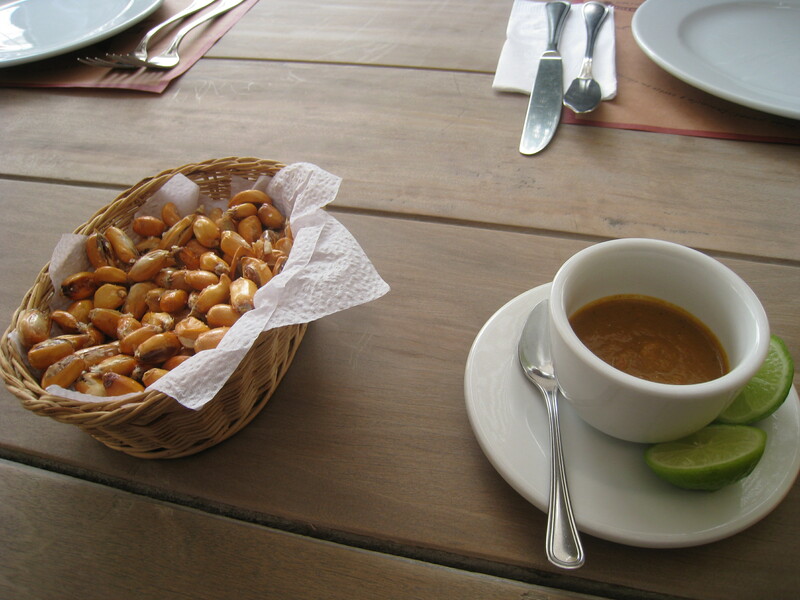 Cancha is a snack that is toasted corn, usually the choclo variety. Here it is served with an aji sauce (ah, aji…we meet again). Cancha is delicious, addictive, and sometimes dangerous. The toasted corn contains bits of husk that, when swallowed, can become stuck in the windpipe. This apparently only happens when one eats far too much of this crunchy, salty (and with the aji…tangy) snack. This near-choking experience was only the literal appetizer to what awaited me for the main course. For my lunch, I ordered one of the restaurant’s signature ceviches. Ceviche is a Peruvian mainstay and it is comprised of raw fish marinated in lime or lemon juice. That’s the basic. They joy in this dish comes with all the different additions chefs and restaurants throw into the mix. My dish would include curry, mango chutney, shrimp, and calamari to the uncooked white fish. When my meal arrived, proudly sitting atop the mound of seafood was a round slice of red pepper. This was a true treat as my expeditions to the local grocery stores have shown me that the vegetable known here as pimiento rojo was rather expensive. So, without a thought, I popped the entire circle of red (seeds and all) into my mouth. Have you ever seen that cartoon cliché of a character with smoke coming out of their ears after eating something violently hot? While there was no actual fire in my mouth, it certainly felt like there was a conflagration going on in there because I had inadvertently eaten an entire slice of the rocoto pepper. The Wikipedia article that I linked to above says that the rocoto has a Scoville rating (the measurement of the heat of a chili pepper which is named after its inventor Wilbur Scoville) between 50,000 and 250,000. By comparison, the jalapeno has a Scoville rating ceiling of 8,000. I wish I could tell you how the ceviche tasted, but after the rocoto, my taste buds went to the Mayo Clinic to recuperate. Seriously…mayonnaise helps ease the pain of a capsaicin-induced accident. 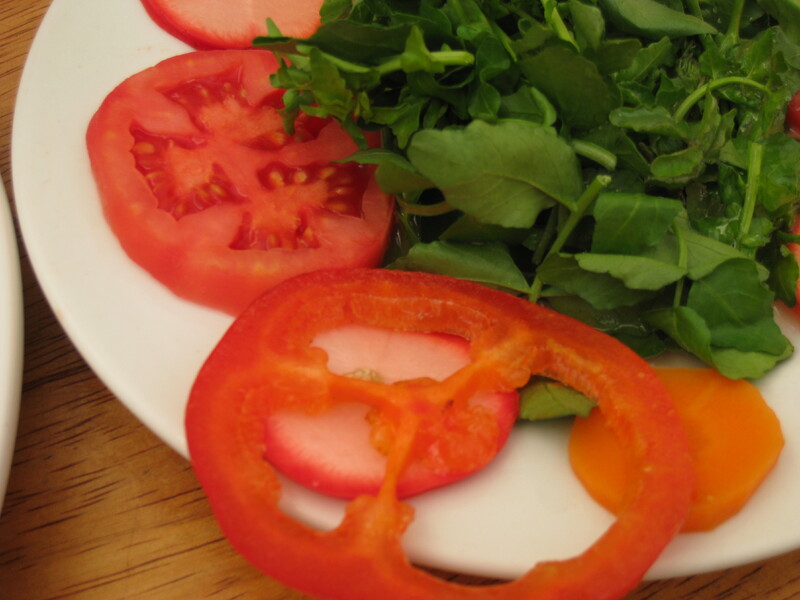 It's red and it's a pepper, ergo, it is a red pepper. While I have learned my lesson about telling the difference between a rocoto and a red pepper, I most likely will continue to dive head first into the culinary world that Peru has to offer. Hmmm…I wonder what cuy tastes like? Posted on January 1, 2012, in Difference, Peru and tagged aji, cancha, ceviche, food, Lima, Miraflores, Peru, Pescados Capitales, rocoto. Bookmark the permalink. 11 Comments. Score!!!!!!!! Sin Polaris experiences the incredible delight of food, usually fish and such, cooked in lemon juice-go figure. Then he scores a sacred spot(s) within the country. Could be better than a family photo. Life moves fast. “Life moves fast”. Indeed it does. Happy New 2012 to you. Ah, yes. The infamous ceviche story that we, in the office, found most entertaining for WEEKS!!! Glad the heat (and pain) could bring such heart-warming goodness to the ol’ office. I have tried rocoto since, but in moderation, and with some chorizo.